If Frankfurt is the financial capital of Germany, Heidelberg is certainly Germany's romantic center. As one of the only major German cities to escape serious damage from RAF and American bombing in WWII, Heidelberg today is renowned for its old world charm and historic architecture. With the Neckar River winding through it and a historic castle on the hill above, Heidelberg's scenic beauty provides plenty of Kodak moments for its estimated 3 million visitors per year. That's a big number for a town of only 140,000 year round residents, which includes the 30,000 students who attend Heidelberg University. After staying in Heidelberg for a few days, I can personally attest to the beauty of the city and its surroundings, as well as to the crush of tourists that fill its kilometers of walking plazas and narrow streets during the summer. From what I have seen of the state of the pavement throughout Heidelberg -- from the major streets to the walking plazas to the small, winding side streets that characterize the inner city -- the city workers are, for the most part, doing a fine job. I was also impressed with the frequency with which recycling and trash containers are available throughout the city. "We want our city to be known as clean throughout, and that includes areas that don't happen to be street pavement, like under trees and in grassy and other areas," said Lang. "All of our sweeper operators have cards they can give to anyone with questions, critiques or requests, and these are for any type of situation surrounding all types of city cleanliness, not just streets. On the inside of the card are numbers to reach city managers in the areas of recycling, biological waste, sweeping, etc., as well as my direct number. Our goal is to keep our city clean everywhere, and we want to make it as easy as possible for our citizens to be involved in that process. "We put a great deal of emphasis on educating our citizens about what they can do to help keep the city clean, too, from teaching kids in the schools to inviting people to call us when they see anyplace that needs cleaning. If someone gives us a call to say they have seen someplace that needs to be cleaned, we send workers out right away to take care of the situation. That's the kind of citizen involvement we want to have." Mechthild Stein is the person who, for the last 10 years, has been in charge of this education process for the City of Heidelberg. She has worked throughout the city's school system, as well as developed a host of other programs designed to raise awareness about keeping the city clean. More on the programs she has developed later in the story. Although a significant amount of the inner city's brick-paved streets are now set in cement, I was told this is something that isn't working out that well. Cemented brick pavement doesn't last as long, and it is difficult to match the color when repairs need to be made. Another big factor is that the streets were originally designed to have sand in between the bricks, and the storm drains are sized and spaced accordingly. When cement is used, water can't drain down through the street and so fills the storm drains much quicker. In terms of removal of small particles, sand bedding also allows the smaller, more pollution-laden particles, to sift down through the earth. This would appear to be a better solution than having these pollutants run to the storm drain and then need to be filtered. The move back toward sand bedding will have an impact when it's time for Heidelberg to replace its current fleet of small sweepers used for cleaning the brick streets. They will be looking, Lang said, for sweepers that use just a mechanical action, not suction. Also, since one of the problems the city faces is winters with below freezing temperatures, they hope to find machines that can continue to clean during that time. Now, all its sweepers use water for dust suppression and so are unable to work during portions of the winter. This generates complaints from citizens and a level of cleanliness they are unsatisfied with. Unfortunately, they must wait another 4 years before they can make the switch, since their current fleet is 4 years old and they plan to get between 8 and 10 years of service from their sweeper fleet. That expected longevity is why, when it comes to upkeep and cleaning, Lang places the same emphasis on equipment cleanliness as he does on keeping the rest of his city clean. As most readers will know, such a long machine life can't happen without a good preventive maintenance and daily cleaning program. To get this type of useful service life, all of the city's sweepers are thoroughly pressure washed after every shift, and the machines kept in good operating condition at all times. From what I saw of their fleet, they have a program that works well in this regard. 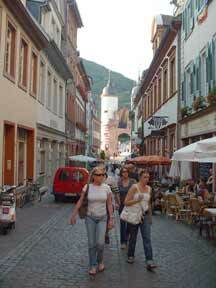 Heidelberg has a total of 580 kilometers of pavement that must be swept. The inner city's tourism area is cleaned every day, and the other main streets receive attention between 3 and 5 times a week. The outer areas of the city are swept a minimum of once or twice a month. In addition, Heidelberg sweeps the U.S. military compound, where 20,000 Americans live at any given time. Sweeping, as well as trash pickup, recycling and snow and ice removal, is done by the city under an ongoing contract with the base. Travis Vowinkle, Manager of the Operation and Maintenance Division that handles the contract, used nothing but superlatives to describe the job being done for them by the city's workers. Heidelberg's current fleet of small, plaza-type sweepers consists of 1 Hako Citymaster 1800 and 4 Schmidt-brand machines. All of these use air as part of their pickup systems. The Hako sweeper is easier for them to use, said Lang, because its airblast is more sideways than that of the Schmidts. As a result, there is less of a tendency to remove the sand that provides a foundation for some of their cobblestone streets. The Schmidt sweepers, because they have a suction system that pulls air straight up, have more of a tendency to create trouble with the roadway. The city also has two large road air sweepers, a Faun and a Schoerling. These both have 4 cubic meter hoppers, and are used for the wider, major roads throughout primarily the outer city perimeter. In 1999, the year for which information was available, Heidelberg's street department removed 1,200 tons of material from the city's streets, and emptied 4,000 trash bins. There are a total of 45 employees in the city cleaning department. In addition, the city cooperates with an area social program that puts unemployed people to work. Some of these people are put to work using brooms to sweep areas of the city that can only be cleaned in that manner. One of the biggest problems faced by Heidelberg is the same as that of most major European cities -- and many in the U.S., for that matter -- which is an inability to sweep where cars are parked. Unlike most places in the U.S., however, Heidelberg uses no backpack blowers as part of its program. Interestingly, this isn't so much because of the noise level that backpacks create, as I had heard in other places in Europe. Rather, because virtually all of the areas where this is a problem have apartment buildings rising above the street for a height of 4 to 6 stories, the concern is dust. When blowers have been tried, Lang said, the dust created many complaints and concerns about health issues such as asthma. The citizenry made it plain they didn't want this dust to happen. As an alternative, the city has workers with brooms who do cleanup along curblines in these areas, as needed. Another area where citizens have had their say, I was told during my travels in the city, concerns the many sidewalk cafes dotting the tourist zones. All tables and chairs must be put away at night, and this must occur by 11pm or the owners face a hefty fine per table or chair still on the street. This law has been enacted because of the noise made by removing these items. This probably explains why sweeping is primarily done during the day. Sweepers begin at 6am and run only as late as 11pm. For the downtown and inner city tourist areas, sweeping goes just until 3pm, since by that time the areas are so congested that sweeping becomes out of the question. However, city workers stay in these areas and empty trash containers until 7pm. Like all the other cities I've seen in Europe with cobblestone or brick street surfaces, Heidelberg has a problem with cigarette butts and other small material that gets lodged in the cracks of the road. "What the machines can't pick up from between the cracks we simply leave there," Lang told me. "There's really nothing we can do to clean them up, and there's no way to allocate the time for workers to clean the material out by hand. If the machine doesn't pick it up, we're stuck with it. "On the other hand, our workers' job description is not 'street cleaner,' but 'city cleaner.' We have some people with brooms, and we want them to clean up the areas around where trees have been planted, as well as grassy areas and other spots the sweeper machines can't reach. We want those areas to be clean, too, not just the streets." 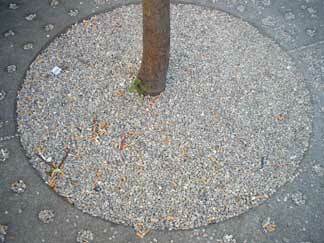 As you can see in the nearby photo of the many cigarette butts around a tree in one of the plazas, cleaning these out from rock areas like that is a big problem. In Germany, an estimated 40% of the adult population are smokers, to the magnitude of the situation is larger than in the U.S., where the number of cigarette smokers we have is on the decline. "We have a well known hotline that people can call to let us know when there are areas that need cleaned." said Stein, "They do call and we do go out and clean up where it needs it. It's very important to us that citizens know their input will have an impact." Stein has developed a host of programs designed to promote city cleanliness. As an example, she is responsible for making and distributing 6,000 large, full color posters throughout the city in just the last 2 years. The posters, put up in places like bus stops and other areas with a large amount of foot traffic, are designed to bring to people's attention the importance of not littering. The posters feature actual city workers, not models, wearing the distinctive orange uniform worn by cleaning personnel. The posters say, for example, "If you find dirt, you can give us a call. Also, you can put it into the correct place, you don't have to wait for us to do it." What they are after is involvement by the citizens to both let them know when cleaning is needed and to be aware that they, too, can pick up trash and put it in a proper place. "We also have developed many actions we are involved in each year," said Stein. "I teach children throughout the schools, as well as at events that happen during holidays. We have a children's conference for the environment that's held each year for kids 10 to 14 years of age, and one of the areas we teach them is the correct ways to deal with trash. They also do projects, and we assist in these to provide materials they might need, as well as get them media exposure so that their efforts can be known throughout Heidelberg. "We teach the children to pick up trash when they see it, and to put it in the right place. During the spring many people clean up around their flats, and we have a program to do the same thing in the city. We get involved with special cleaning programs throughout the city during this time. Each year we do a big action project at this time of year, and have special haul-away programs. We also involve well-known sports team members in these projects, and put ads into the newspapers about it. In addition, we partner with national and local environmental organizations to do special cleaning projects, around schools and so forth, and in finding ways to involve more citizens in awareness. We consider Heidelberg to be the top city in Germany, in terms of our conservation programs and taking care of the environment." Sweeper operators, as well as other department personnel who might come into contact with the public, are supplied with information-containing business cards. These folding cards, which have the message you see in the picture to the right (which occasionally translates to what it means in English) on the outside. On the inside is a list of the contact information so the various cleaning and other city departments may be contacted easily. "If someone has a question for us, or a concern, we want to make it as easy as possible to get hold of us," said Stein. "Especially if someone is upset, we'd rather our managers handle it than having sweeper operators have to make decisions on the spot." Unlike many other European cities, dog poop doesn't appear to be much of an issue for Heidelberg. The reason, I'm told, is because they are so proactive on the issue. "We have stations throughout the city where plastic bags and mitts are available at disposal bins," said Stein. "Also, we have a suction machine that is dedicated to picking up dog droppings. As soon as we know of one, the machine is dispatched to take care of it." Another reason may be the taxation system Germany has for dogs. Dog owners are required to pay 120 Euros per year for the privilege, so that may have an impact on the problem, as well. The city's approach to litter-free, whether from a dog or from someone throwing debris onto the ground, also includes a system of fines for these actions. Their public relations campaign makes it known there are fines for these infractions, from 10 to 25 Euros. And, they do have people in the street who assess the fines. Heidelberg takes its recycling more seriously than any other city I've seen to date, with recycling containers located in all government buildings and most all apartment complexes, in addition to the separation containers liberally available throughout the city. I was told there are also 6 manned recycling centers, as well, where a worker is available to deal with more complex issues like batteries, paint and other items that don't fit the 'paper, glass, plastic' of the regular recycling bins. Trash containers are located very frequently throughout the downtown area, every 20 to 30 meters, and these are emptied between 3 and 5 times per day, depending upon the time of year and on the weather. However, the city has taken a somewhat unusual approach to parks, wooded areas and other perimeter locations. In these places, primarily because people were continually filling the containers with household trash, they have taken out all the trash bins. Instead, people are told to take away anything they bring in. One of the areas of the city I visited, a primarily walking road above the river called Philosopher's Walk, is one where the garbage cans had been removed. One resident showed me a garbage container he said some of those in the area had put in on their own, because of the litter problem that had occurred when the city removed its containers, so this idea may not be working as well as is thought. It's clear that Heidelberg city officials take seriously their front-runner position as Germany's environmental showpiece. Like many cities, their sweeping level is comprehensive. However, my review uncovered a weakness in their overall program, which is there is currently not an inhouse inspection of the work quality being produced by their workers. At the beginning and end of my time in Heidelberg, a span of 4 days, I took a look at several specific spots that should be cleaned on a daily basis. Especially around trees and landscaping located in high-traffic tourist areas, in some areas the same debris remained in place. Although encouraging citizen input about areas that need cleaned is a great idea, relying on it is not. The Heidelberg program would benefit, in my opinion, by including someone from the public works department whose job it is to 'inspect what they expect.' Currently, they have no such inspection system. However, this is a minor point in what is largely an excellent public works program. More than any other city I've seen, with the possible exception of Copenhagen, Heidelberg is proactively educating its people about the issues surrounding littering and city cleanliness. Their commitment to cleaning excellence is, well, excellent, and the organization's management seems top notch. This viewpoint is also echoed by those in Europe whose task it is to keep track of such things: The European Commission chose Heidelberg to be the recipient of its European Sustainable City Award for 2003. The city also received a Certification of Distinction in the area of waste management. It's no wonder, since the positive level of results the city is producing is apparent from one end of Heidelberg to the other. 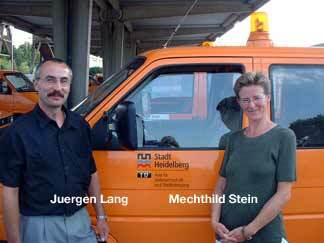 If you'd like to contact the sweeping department of Heidelberg, click here to send an email to Mechthild Stein. Our next stop will be the long-awaited tour of the Hako factory, in Bad Oldesloe outside Hamburg. Although the tour itself took place toward the beginning of the Sweeping Around Europe odyssey, we'll have the story itself as part of the rest of our German sweeping coverage.